Well, here I am today at 33, an old married woman who breached the 100 pound mark quite some time ago. In my defense, Atlanta is far from Uniontown, if not “far far” away. And although I may not be the jetsetter that some are, I’ve been to Mumbai, Delhi, Goa, Kerala, Ahmedabad, and Surat India. 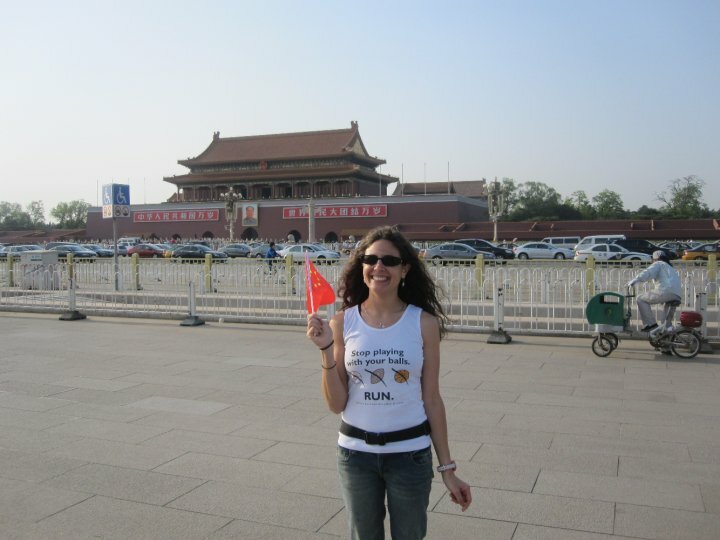 I’ve seen Shanghai, Beijing, and Xian, China. I’ve been to Costa Rica, the Dominican Republic, Mexico, Canada, Jamaica, Amsterdam, Dubai, New Zealand and Fiji. I’ve explored Sydney, Cairns, and Melbourne, Australia. I’ve stood inside the Taj Mahal, ran a marathon on the Great Wall of China, swam with the fish in the Great Barrier Reef, hiked an active volcano, zip lined through a rain forest, and went white water rafting through the jungle. And Yes, I’m totally wearing a fanny pack. I swear it’s not photoshopped! And yes, Black and Yellow, Black and Yellow…even in India. And having been a place or two, it gives you perspective. Makes you appreciate your life, your circumstances, your self-indulgent idea of your “struggle.” Having just come home from a long trip abroad, the one thing that resonated with me afterwards was while it’s great to visit for a bit, there really is no place like home. And by home, I mean no place quite like the good old US of A. 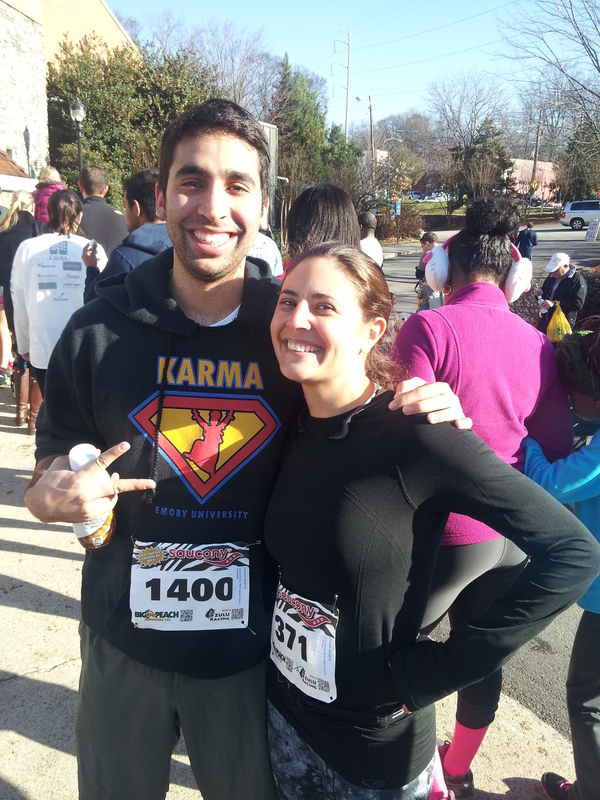 In honor of the good old USA, Inauguration Day, and MLK Day, I ran the MLK Day 5k this morning. A good friend who is a lot more conservative than I in her political views (they don’t call me the Super Lib (Liberal) for nothing….) 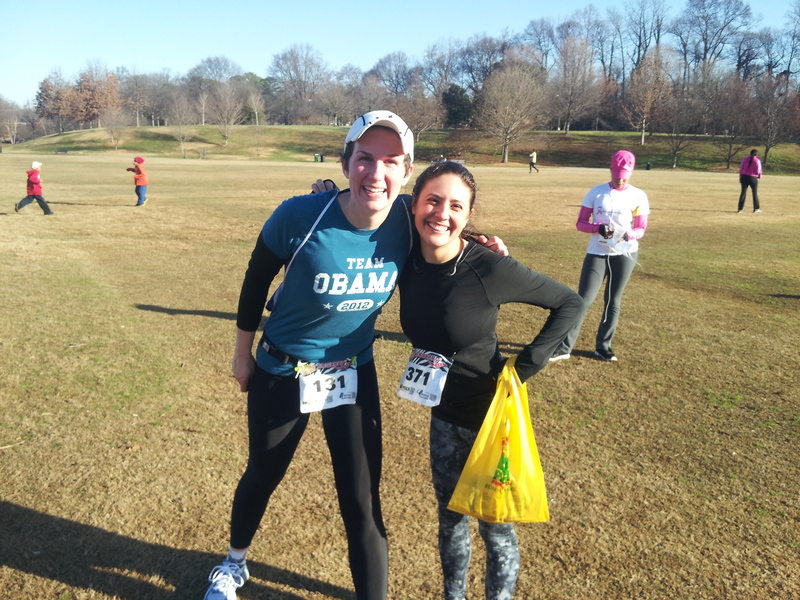 told me that she lost a bet whereby she had to run a race in a “Team Obama” shirt, and that this was to be the race. This was something the Super Lib could not pass up. The race was in Piedmont Park, about a mile from my house. And it was a chance to run a race on a Monday. That sounds fun, right? So I signed up. I bundled up and was out the door. I must say I didn’t really feel like racing…but as usual, I made myself go anyways. I got there and realized I was way over dressed and was hot. I was bundled like a snowman and it didn’t agree with the near 50 degree temps. There were long lines for the port-a-potties and there was a lot of commotion. I was flying solo at this point, and the whole scene was giving me major anxiety. I abandoned the port-a-potties due to the length of the line…my building anxiety convinced me I didn’t have time… so to the start I went. It was a huge open start in a muddy field in the park. Turns out I should’ve stayed in line for the port-a-pottie because at 9 AM I swear there were seven different renditions of One Moment in Time or a similar Whitney Houston ditty. Pretty much everything but the race starting. But then it did start. I shot off. It felt horrible. We started up a steep short hill through the mud. I. Do. Not. Like. This. Not. At. All. My lungs and quads burned. I thought, I’m just gonna bail and jog home. Screw it. I’m just not feeling it. But then I bargained with myself saying “Just give yourself a chance. Just finish this first mile and see what you think.” Luckily, around this time, some Amazon of a girl trampled me in her mad dash, throwing elbows and all. I guess she thought she was going to win the Olympics or something and I was in her way. Or else she couldn’t see me down there on the ground. I don’t know. It’s hard to make conjecture when being trampled. This irritated the crap out of me, and I made it my mission to beat her. Once I have a mission, I’m all set. Zeroed in on her and…. here we go! As it usually goes, after that first mile I was fired up and totally into it. Passed the Amazon and just kept at it. Alicia Keys belted out “This Girl is on Fire” and I thought, hell yeah, this girl is on fire! I’m running on fire! Go! Go! Got to the finish huffing and puffing lungs a burning. Checked the old watch. 21:17, Good, not great. But great considering my swell defeatist attitude and crappy start. Got myself some water, perused the snacks and waited for Catherine. She came through blazingly fast as well and looking cute as can be in her Team Obama shirt. Totally loving it. Posed for some pictures, then we parted ways. I’ m lovin’ the Team Obama! Thali was there too!!! But we were missing the Jamaican Sensation!!! I was about to jog home when I saw some people gathered around results. Thought it couldn’t hurt to take a look. 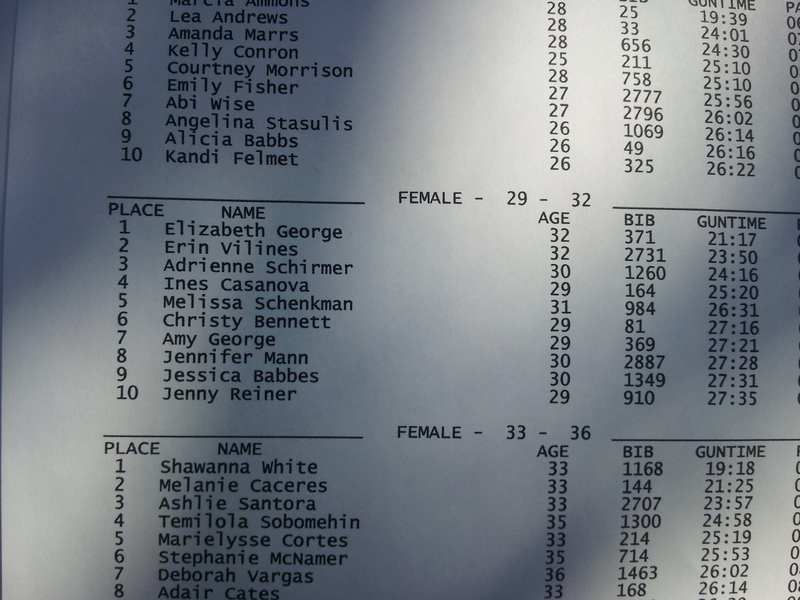 Low and behold, there I was, first in my age group and 48th overall!! Who would’ve guessed? See what can happen when you just give yourself a chance? 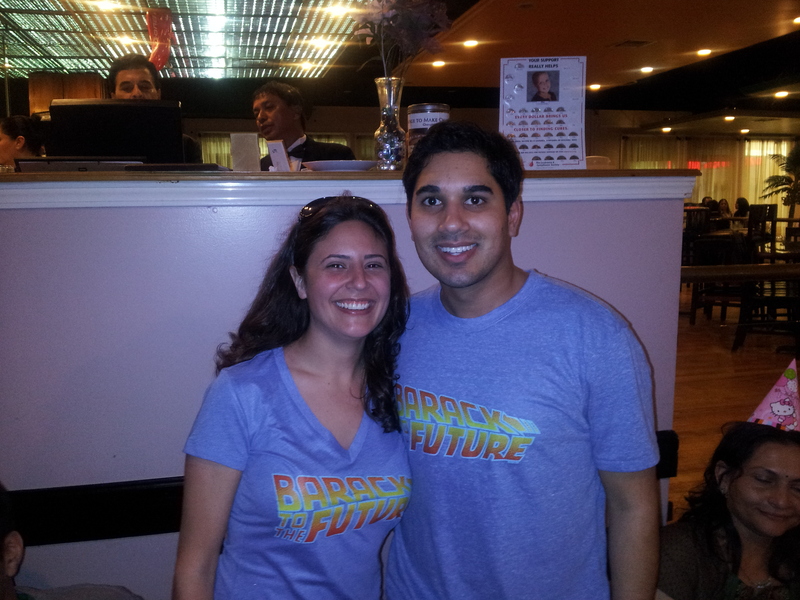 Afterwards I donned my “Barack to the Future” shirt, and went to the office to put in some work with the husband. Someone’s gotta make the money to support my running habit. We watched the Inauguration on TV in the office. I know I complained so much when he bought that stupid thing, but I was never happier that we had it than today. One in a long line of frivolous purchases, it was now totally worth it. The Inauguration was amazing. The President’s speech got me all fired up and excited for life again. What an awesome country we have?! For all the bad in our past, we’ve come so far. In the same vein, we still have so much work to do. It got me thinking. The USA is a lot like most of us. It’s diverse. It’s unique. But most of all, it’s come so far yet still has so far to go. A work in progress. Everyday. The last couple years I’ve been working on becoming a better, happier, more fulfilled person who contributes to her community, to her family, to her world. I’ve come so far, particularly in the past six months or so since I fled the soul sucking work of a billable hours litigator. I saw my parents over seven times in six months. Extended family a few times. Hung out with my Little Brother plenty. Saw a good friend not once but three times! Volunteered. Cooked for my hubby. Ran. Worked out. Helped out a few people who needed it. Been a lot more tolerable (or so I’m told ;0). You could say the past six months have been a success. But I’ve still got a long way to go, and a lot more to do. And so off I go to work on the work in progress that is me. Love the recap, MG! 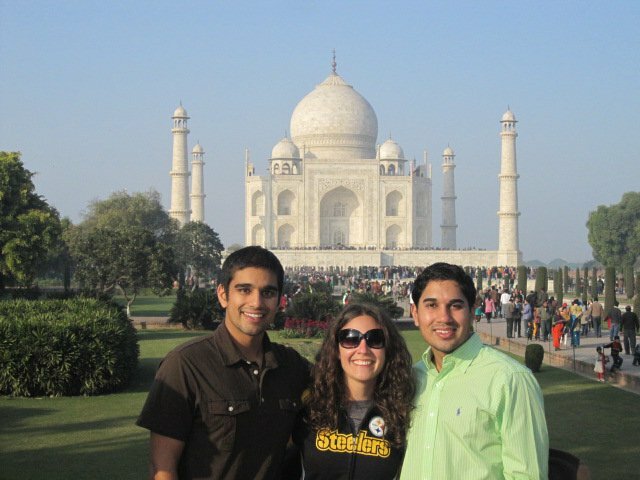 I especially love the picture of the Black & Gold in India! It’s more than a Steeler Nation, It’s a Steeler planet! Very nice!